Snag ticket information over at Ground Control Touring. Keeping up with Somos﻿. Back on tour! But not the old tour they dropped off of. It's a new and improved tour. 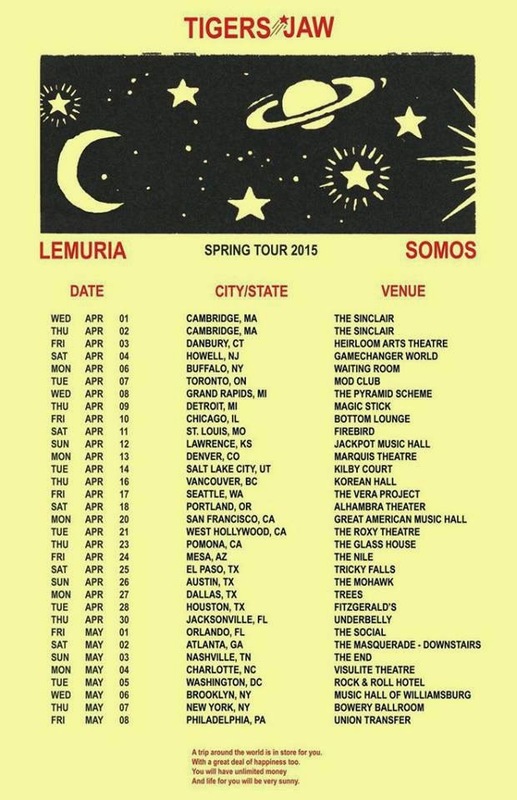 Less than a week after Somos announced their decision to drop off the Dads / Roger Harvey Tour in February due to personal issues that would render a tour "daunting and unmanageable" at this time, the band came back on a high note by revealing they will join Tigers Jaw and Lemuria on tour this spring. The whopping 33-stop tour will begin with a two-night kickoff at The Sinclair in Harvard Square. Tickets go on sale Friday, 1/16 at 10am. Information can be found here.